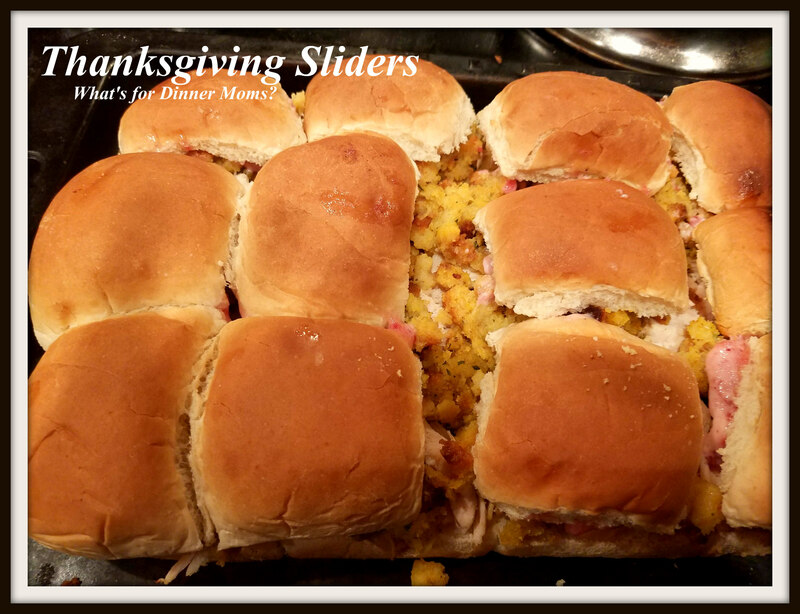 Thanksgiving Sliders – What's for Dinner Moms? I still had a whole turkey in the freezer and knew time was going to be tight this week. We roasted the turkey and split it up into portions to use and freeze. It has really helped make dinners (and lunches) a bit easier. Both of my kids thankfully love turkey sandwiches and happily will eat them for lunch or dinner. And it doesn’t need to be Thanksgiving to enjoy all those yummy Thanksgiving foods! 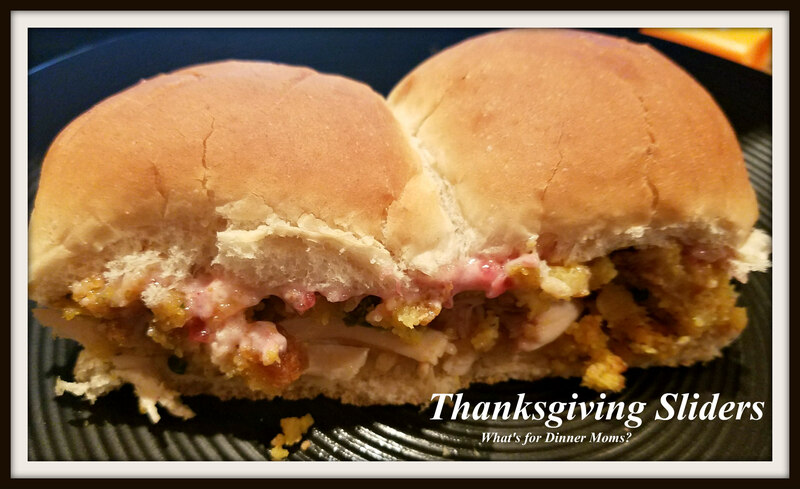 This recipe is a combination of a casserole that may family loves after Thanksgiving and the little slider sandwiches that are so easy to make. Remember I said try turning the things you like into new dishes. Casseroles into sandwiches, soups into casseroles or sandwiches into pizza. This was a casserole turned into sandwiches. These were a hit! They are so simple to make once you have all the ingredients. Roasting the turkey and having some leftover stuffing made this a super simple meal. If you do not have leftover stuffing you can make the red box stuffing or a bag of your favorite herbed stuffing. The mayo and cranberry sauce may sound weird to you (it did to me at first) but it was delicious! It adds a hint of sweetness to the dish. Perfect. Place bottom layer of rolls in pan. Cover rolls with cheddar cheese, if desired, in a single layer. Add turkey to sandwiches covering the entire bottom of the rolls with turkey (be generous). Spread stuffing mix over the turkey layer. In a small bowl mix together mayonnaise and cranberry sauce until well blended. Spread as much as desired over the stuffing mix and add the tops of the rolls when done. Brush the tops of the rolls with melted butter. Bake for 10-12 minutes until ingredients have warmed through. Serve hot with extra cranberry mayo if desired. Looks Yummy and not only for Thanksgiving! Thank you! I love Thanksgiving foods! You’re welcome! I could eat dressing year round! Yes! I could just eat dressing all the time! I always like these baked, layered sandwiches don in the oven, but have yet to make any. I’m on the other side of the cranberry camp with these, but do like them otherwise. Thank you! I hate cranberry sauce (weird texture and flavor) but interestingly enough liked the cranberry mayo. Maybe it was the mayo, who knows? Strange! I normally like any type of cranberry, but not with anything else. My mom has a great cranberry chutney recipe we make at Thanksgiving.